Wag Wagon Pet Services offers Professional Pet Sitting and Dog Walking services in Kittery, Kittery Point and York Harbor, Maine as well as Downtown Portsmouth, New Hampshire. 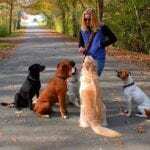 Thank you for visiting my site; I hope I have the opportunity to care for your pet! Please send me an email and I will get back to you as soon as I come in from walking the dogs (or cuddling a cat! ).